Document is proof on Legal intelligence which guarantee for all foreign states, and their opportunity for act on The One World and common federalization, confirm a step as a most important and successful step in all time's of history of Your policy, government and state in your. The One World ! Document is proof for International bodies, the Government's and Supranational Organization's, we are is developed for legal function, according legal affair's, and for responsible execution. We don't have complication in Office legality, and we welcome all Declaration's for recognization on our legality. The ID's office for provisional function, all Commercial Service and NGO Institution's have right join our government according Ministerial categories, and support executive and organized function of ID's Office's. 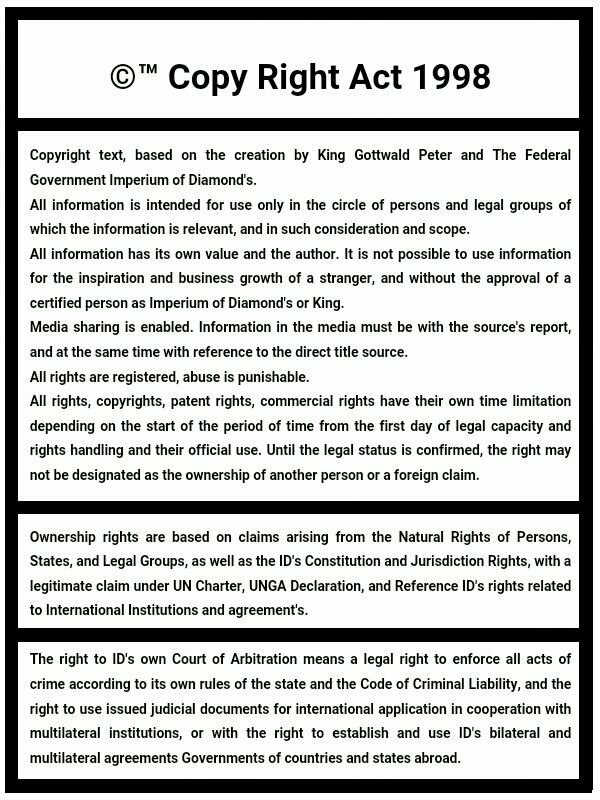 The Imperium of Diamond's Federal Government is legal political institution according principles of the international political intelligence and rule. We are have the territory, and we are have the right for active sovereignty in our country. We don't create any act of violence agains't International Law, Peace and Security, we are is together respectable for legal affair's with our interest and join in diplomacy and peace democracy, justice. Our right for governmental development is protected by the United Nation's Charter of Organization, UN General Assembly Covenant's on Political and Civil Right's, Universal Declaration on Human Right's, States Economic, Cultural and Social Right's, Declaration on the Granting of Independence to Colonial Countries and Peoples, and principles of the treaties on Universal Political Principles. According such right's is therefore Declared ID's Ministries of Federal Government. ID's Information city consolidated by the NGO's & INGO's with the New's Agencies in the whole world, is center for establishment new Commission administrated by the ID's government authority, in interest for research on global civilizational dynamism, apply for new inspiration of the intelligence research and also use strategical opportunity for expansion of the civilizational level and political intelligence. The One World interest, join the Federation is act only for pride, strength the country and have a pride for best available progress. The World Diamond is progress for intellectuality of policy and state, civilization and growth, mean step on recognization for future of humanity and new ability of step for better world. The One World and federalization act is only good step for Your country and no one can recognize responsibly in difference. System of the Ministry represent most intellectual scheme of governmental board in history of human world. Ministry of Interior control cooperation with Security department's and protect the integrity of state, organize security strategy and administrate national geographic quotes with security principles, control security of technologies, administrate security of border's, documenting evidence of people and their criminal record's, observe strategies of law development. Ministry control evidence of legal document's and card's, pasport's and VISA. Ministry represent Federal Judicial infrastructure, administrate justice trial's nd criminal prosecution, protect people against injustice and crime. Ministry administrate state law evidence, history of state action in law connection and chronics of law documents in archive sterilization, with legal function as second notary observation and security control. Ministry develop active evidence which documenting all legal activities of government and state. Ministry represent and administrate infrastructure of the police department's and investigative institution's, protect independent function agains't other security department'snd therefore guarantee stabile safety of states without fraud and corrupt effect. Ministry analyze criminal intelligence and develop strategy how to force and prevent criminal event, modified people intelligence for prevention on radicalization and criminal organizations development, stop all terrorist movements. Ministry actively control Federal and International space for prevention on monopoly against state and government. Ministry is authority of special independent investigative unit with ability for active control of political and state service environment, people connected in civil structures. The Ministry is active autonomously, under own order and investigation practice, represent own consolidation of multi intelligence of separated parties which control partner's between, study security environment and development of anti fraud policy and anti corruption, prevent the violation of law in political structures and abuse of power. Ministry organize International Security partnership and construct global affair in common protection strategy by the geography monopoly activation or law development, also develop International and Global Infrastructure of security center's for global security activation. Ministry control special events, unknown effects, not registered movement's, no knowledge technologies and physical activities or messages. Ministry control all civilizational activity and special form's of the affair. Ministry investigate special political, security, or conflict situation. Ministry administrate special infrastructure and organized site of intelligence department's, control special zones of research and development, build infrastructure of the active security protection in the country. Ministry actively control state security, special security forces and urgent connection of security department's, and develop international alliances of security and information cooperation. Ministry develop special infrastructure for control activity of mathematic and physical reality and combination, investigate activity of time prediction and research, administrate special laboratories, science research centers and technological development institutions. Ministry administrate security affair's and control military development, action and strategies. Ministry administrate military areal's, zone's of military camp's and colonies or special center's, also with Military Laboratories, Research Center's, and center's in evidence under special program's. Ministry registry or produce soldier's. Ministry control International Security competition and administrate strategy of development in competition, quality and dominance. Ministry design a law's and develop International Law connection. Ministry Authority consist every Diplomacy department of all Federal states and develop organized diplomatic connection with every state and institution in the world, strategically plan international diplomacy relation's and activity. Ministry Internationally represent government and political affair's of Diplomacy, represent bilateral and multilateral agreement's between states, connect International Infrastructure of Consulates and Embassies, represent the nation and connect International Political relation's. Ministry is developed for active research in all kinds of International Law and develop database monitor of global civilizational law progress with the intelligence centralization according research of civilizational and state grow, with a central council of Law Professional Team for inspiration and development ID's Law in a best open opportunity for active civilization and quality for life of people. Ministry administrate activity, right and process of organized function within foreign institution's active in federal territory under governmental program's for globalization and connection between nation's. Ministry represent affair of intelligence in strategical people centralization on global level, according strategies of federal council's and institution's for world centralization. Ministry develop law and maintain stabile order of global coordinated function. Ministry represent strategical growth of intelligence according diplomacy connection and political cooperation for development design's and plan's of the world centralization, active rule and mechanisms of the peace stabilization, war prevention, business grow and partnership, unity of generation's, development of united world and also documentation on world progress, inspiring for new law development. Ministry develop strategies for partnership between states and connection strategies building in interest for support all states in the world, for ID's federalization and building one state, The One World. Ministry centralize strategy of the protection for a world, support development of lower civilizations, prevent famine, health risks, education missing of level, and war's. Ministry administrate strategy of the protection the Heritage of Mankind in category of Law development, Justice, Natures, Cultures, Traditions, People Trends and shared properties or rights. Ministry control and develop industry of Aero space program's, develop industries and research space physic for technological synchronization, normalization and active control quality of development, registry licences, develop law, and administrate special areas and unit's active in Space Affair's. Ministry centralize Space Affair's in political category, administrate licences and certifications, develop infrastructure of space civilization, control function of the space division's and colonies, administrate new law development and develop intelligence. Ministry administrate intelligence of space industry development and centralize divided intelligence of colonies, also registry and control space mission's, registered space areas and center's. Ministry is organized for affair of Space science, research, mapping, also control and develop own science. Ministry administrate and actively develop intelligence in Terra-formation, research and organize new center's of planetary formation, administration of laboratories and science institution in affair of the land formation. Ministry administrate the technological infrastructure of energy industry and science research, growth new intelligence and apply on civilizational use, research active space physic activity and design technological function of civilization in interest for protection of environment and health life space, control the areas of investigative institutions and develop special program's for development. Ministry Administrate the law of Universal Civilization Ship, internal order and jurisdiction, political and civilizational order, develop and design technologies according active research and science building, registry ship's and center's, administrate special factories and industrial center's. Ministry control and administrate Space Transit and develop new routes of space navigation, registry route systems and their activity, develop space transportation infrastructure. Ministry control space universal geography sources, investigate, laboratory research, administrate land map scheme and inter-activelly mapping. Administration, registration, control and law development, calculate on source level, research and organize cooperation for mining industry, primary sector of economy in Space affair. Ministry control and administrate Space Telecommunication and develop new sites of space communication and data transfer. Ministry research and study un-knowen and no registered activities and develop new connection's in interactive communication. Ministry analyze and document all kinds of the world statistical information, research and strategically build global intelligence, strategy of use and development on federal and international level. Ministry control civilizational statistics and centralize informations, registry data from all institutions and sensor technologies, centers, and databases of activities, develop also interactive systems of Civilizational Statistics Intelligences. Ministry control function of civilization and analyze statistic's of the production, consumption, process and development, according regulate norms for stabile action between people and institutions, and care on health equality. Ministry control function of civilization and analyze statistic's of the production, consumption, process and development, research on civilizational ability and develop new science in futuristic industry on maximalization and express growth of new level of civilization, according new regulate norms for dynamic function according civilizational available consumption and function, stabile action between people and institutions, and care on health equality. Ministry control process of state education in all generations of people. Administrate strategy of education process and pedagogic practice, grow intellectuality of people on maximal level of intelligence and civilizational need's for development, registry education center's and universities, develop new education center's according civilized need, administrate statistic's of education and intellectual progress. Ministry observe statistic's of work market and people professional intelligence, strategy of civilizational development with the education grow under available work and job opportunity or free space for development of new firm's and companies. Ministry actively study International trade sites of the world economy, business institutions and strategical source of business, law formation's and intellectual business difference between countries. Ministry design new federal trades and support their active expansion on international level, strength active intelligence of people and build power of development for federal business institutions, strength federal civilization. Administration authority of business and economy strategical building, grow of state business site and economy, strategically plan financial manipulation, protection of banknote copyright's and stabile system of state economy, connect all Financial Institution's in the world. Business Law development and strategical planing according best success for people who life in country of Federation, and federal synchronization in effect of stability. Ministry building projects for research civilizational opportunity for building, research on new modernization, maintain stabile line of modernity and strategical progress, develop new opportunity for the dynamical growth of civilization, also registry and administrate special scientific centers and intitution's. Ministry research technological qualities and ability for new strategical development of technology modernity, administrate special research and scientific zones, industrial factories, develop dynamical infrastructure between technologist and design institutions, and plan scheme of technologies and their function according civilization need's and strategical interest. Ministry analyze competition between federal institutions and business companies, strategize on new law formations and profit agreements between subjects in interest on their centralization and stabile regulation on power of the competition, also strength level of competition according market expansion and dynamic stabilization, equivalent profit need's, and prevent also on competitive profit's against states and federation. Administration, registration, control and law development, calculate on source level, research and organize cooperation for mining industry, primary sector of economy. Administration, registration, control and law development, develop infrastructure and intelligence in re-cyclation system's, calculate on source level, research and organize cooperation for raw source artificial productive and re-cyclation industry, primary sector of economy. Ministry regulate energetic industry, control market and sources, regulation source and market trade, develop new energy center's, gases, oil's, electro energy, power source of civilizational function, and develop energetic infrastructure, science research and building, law regulation's and observe security in energetic center's, legal manipulation. Ministry develop Artificial Intelligence codes, administrate AI civilizational infrastructure and operation centers, supercomputer logistic and security, control system function of AI, and prevent AI evolutive radicalization or terrorist connection. 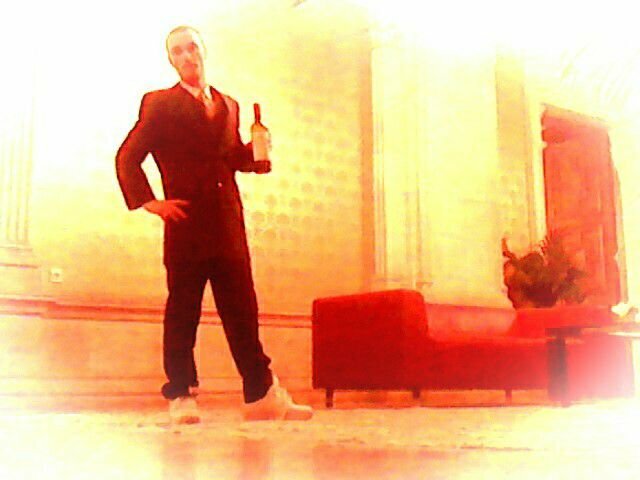 Ministry administrate special zone's, area's, center's and civilization's, control norm's and licences. Ministry administrate industrial sites and infrastructure, control active development and regulate norm's, control licences and active evidence care, education development, science and research, control and planing, expand the infrastructure and space of the industrial areas. Ministry control Construction project's, research and building civilizational infrastructure for construction activity and plan new intelligences, registry construction zones and support for new development, regulate norm's and schemes of the construction industry. Ministry administrate cities, registry new buildings and development projects, registry development materials and structure of development market, observe technical plans of projects and active development management, research and certified licences, control infrastructure. Ministry administrate agro grow source and regulate strategy of agro grow production and market according consumption limit's and management for use. Evidence of farm's, licences and agro-nome sources in category of green's, fruit's, industrial fluors, mushrooms, spices, also bird's, animal's, every kind of available organic source for growth, and development of technologies for agronomy science development and new practices building. Control water source and consumption, infrastructure development and planing, water infrastructure urbanization. Ministry protect un-touchability and health environment of the natural water zones and areas, centers of natural water environment. Ministry mapping natural water zones, registry and study active bio organism's, research material's and chemical, bio chemical studies, genetic studies, and develop strategical protection for safe the natural water environment. Ministry administrate special garden's, zoo and aquarium center's, project's and trade connection's in business development or observation. Ministry administrate sea properties, control and connect International sea law's, develop intelligence of Water economic and activities, research geography and investigate in science, registry evidence of licences and vehicles under Federal flag. Ministry administrate public business service and shop's, evidence of licences and market infrastructure, strategical planing and grow new sites of utility market, centralize utilities business infrastructure on the best available opportunity for people and their interactive use. Ministry administrate Transport infrastructure, law development, certification and evidence of driving pass and licences, and evidence of transport vehicles in state, mapping and control transit, plan transport urbanization and also regulate transport sites according strategical or statistical need's for civilizational synchronized connection. Ministry develop infrastructure of cities, administrate system connection and public development, control security of infra-technologies and schemes, develop evidence of all infrastructure component's, administrate offices, and law development. Ministry develop strategy of telecommunication infrastructure, establish active site of protected communication, control connection infrastructure of sites, anthen's, space probes and computer operation center's, divide system of telecommunication on the civilizational infrastructure need's. Ministry administrate activity of 3D Virtual system's, study and design virtual function and synchronization with human life, real civilization and environment, administrate independent site of telecommunication and special research and industrial laboratories. Ministry represent Federal Media, and Intellectual movement of people of federation, traditions and also strategically grow people union without opposition, intolerance or racism, by the strategical grow of education project's, protect civilizational intelligences and institutions, social events and public projects. Ministry control Media and environment, control stability of public knowledge and prevent people decentralization, radicalization and threat of criminal or opposition inspiration. Ministry registry capacities of tourist exhibition and ISA agreements, expand tourist commercial infrastructure and plan public events for recreation, develop active infrastructure of tourist experience centers nd regulate source of life for tourist management users. Ministry represent Federal cultures, history of country and people of federation, traditions and also strategically grow people union without opposition, intolerance or racism, by the strategical grow of education project's, protect historical intelligences and institutions, social events and public projects. Ministry represent Federal Religion's, and Intellectual movement of people of federation, traditions and also strategically grow people union without opposition, intolerance or racism, by the strategical grow of education project's, protect civilizational intelligences and institutions, social events and public projects. Ministry administrate sport event's, control health of people, protect health of people and condition, build sport event's, centralize sporting trade and plan infrastructure of civilization for maximal support on national active sport development, research and control bodybuilding project's. Ministry control environment of civilization in interest for care on families, observe health social qualities and protect people from risk of the health destabilization, prevent the difference in society and grow stabile system of society in connection. Ministry develop programs for all migrants, i-migrants and refugees, in the strategy for their peaceful integration, health control, education and professional development, defend human rights and equality in society. Ministry develop infrastructure of hospitals, educate doctors, expand medicine science, registry central database of patient's and health cards, establish re-qualifications of medical science, control bio-chemic industries and pharmacies, certified health status of technologies, certify and license the praxes of medic. Ministry develop, control and civilizational use system's of cyber mind transformation, re-plycation and use, share or transfer, stabilize life of people, certified system's of cyber process and control responsible function, administrate special infrastructure, areas, zones and institutions, registry licences and certificates. Ministry control health of genetic norms of people, protect their copyright of genetic codes, develop their active health programs and therapies, administrate Safe zones of Human Genes and strategies for prevention against human mutation in difference for health need's. Ministry also administrate special zones and research centers, scientific laboratories and factories. Ministry research human DNA gene, and research all affect's of gene by active civilizational life, investigate on process for stabilization and also development on DNA code for growth on health and better quality. Ministry research animal's and bio-organic DNA or RNA gene, and research all affect's of gene by active civilizational or natural life, industrial use, investigate on process for stabilization and also development on DNA and RNA code for growth on health and better quality or special strategical modification's. Ministry administrate hygiene infrastructure and institution's in strategical protection on the state hygiene quality, develop active infra-site of hygiene station's for purification of the isolate people from risk of no hygiene space, prevent development on bacterias or viruses, control order of institutions and their source, activate special governmental and civil program's, administrate the laboratories and technologic center's. Ministry control and prevent viruses, bacterial epidemics, develop special infrastructure for purification, research special technologies and administrate special laboratories for science research and test. Ministry administrate management of research project's according civilization development need's and ability for science development, administrate research center's, intelligence research and plan strategy for active civilizational use, actively organizing movement of science progress. Ministry control and analyze weather, air space and administrate special infrastructure of meteorologic sensors and research centers. Ministry control geography sources, investigate, laboratory research, administrate land map scheme and inter-activelly mapping. Ministry control quality of ecology, civilizational function in ecology protection, develop and plan, intellectual organization for ecology strategical building and business develop with ecologic market. Ministry protect un-touchability and health environment of the natural zones and forest's, centers of natural environment. Ministry mapping natural zones, registry and study active bio organism's, research material's and chemical, bio chemical studies, genetic studies, and develop strategical protection for safe the natural environment. Ministry administrate special garden's, zoo and aquarium center's, project's and trade connection's in business development or observation. Ministry administrate special zones and certified legalization for reservations, control internal movement and administrate the process of their influence, development and activity. Ministry registry patent's on new scientific product's and technologies, technological plan's and also the Copyrights for authorship or idea authorization, regulate norms, law development and licence certification, right trade. Ministry control state active opinion of people and their intelligence, represent education projects according profession need's or available growth opportunity for a people, active special medial inspiration's and program's for people intellectual growth. Ministry centralize people pools and public petition's, information's on the democratic recognization of society. Ministry registry all state properties, administrate state infrastructure and certified licences with document's, registry demographic and geographic intelligence. Ministry registry all databases of national chronicles, books of events and culture actions, history process of country and central document's of event's. Ministry registry all official stemp's and registration right's of federation, for official certification of documentation and legal affair, allow control-ship and notary investigation on true legality of all legal connection's with federation.